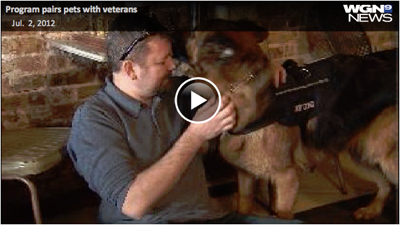 WGN’s Medical Watch focuses on the role of “Healing Pets” in helping combat veterans with Post Traumatic Stress Disorder. Former Navy pilot, Jay Somers discusses how his PTSD triggers behaviors that would threaten to isolate him from family and friends, if not for his companion service dog, Cody. He explains how when he experiences an episode, his German Shepard is trained to take notice and act in such a way as to require specific actions that help him reconnect with his surroundings. The results are as remarkable as they are promising. Although PTSD treatment requires medication and therapy to manage the symptoms, it’s the bond that forms between the returning combat veterans and their rescued shelter dogs that is emerging as key to the healing process. Please view this segment of WGN’s Medical Watch by Dina Bair to learn more about our veterans with PTSD and TBI. In their own words, these heroes share their experiences, and how they are helped by their rescued service dogs.